Paru's is at 5140 Sunset Blvd. in Hollywood. 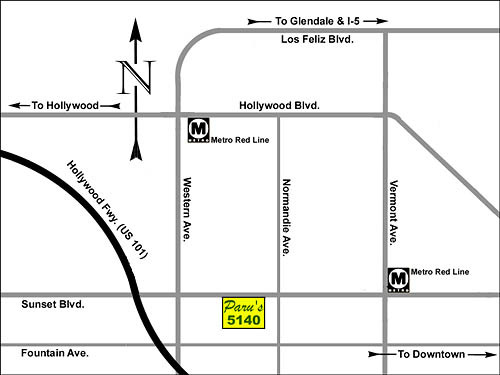 You can get there via the Sunset, Santa Monica, or Normandie exits of the Hollywood Freeway, on MTA Lines 2, 3, 206, 207, or 707, or from the Hollywood & Western or Sunset & Vermont stops of the Red Line subway.